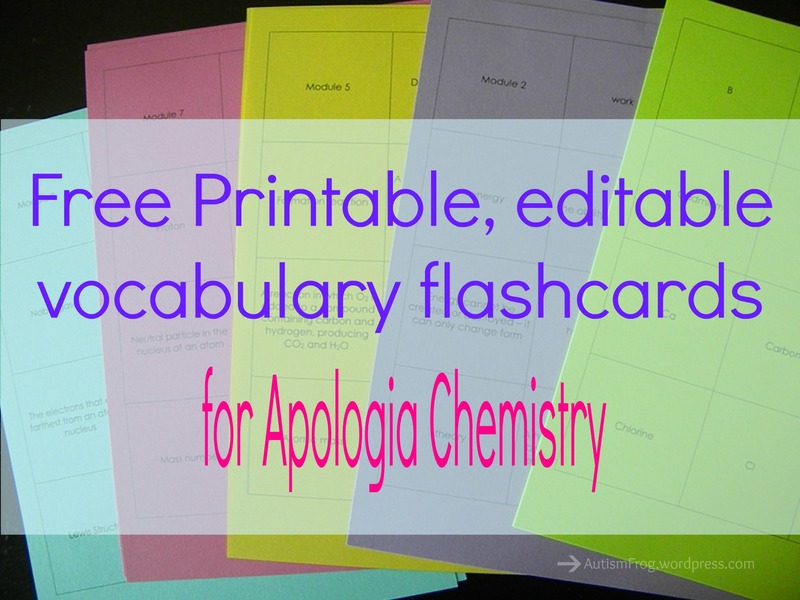 I created printable, editable flashcards for Apologia Chemistry (this is a Word doc but will also work on Pages). 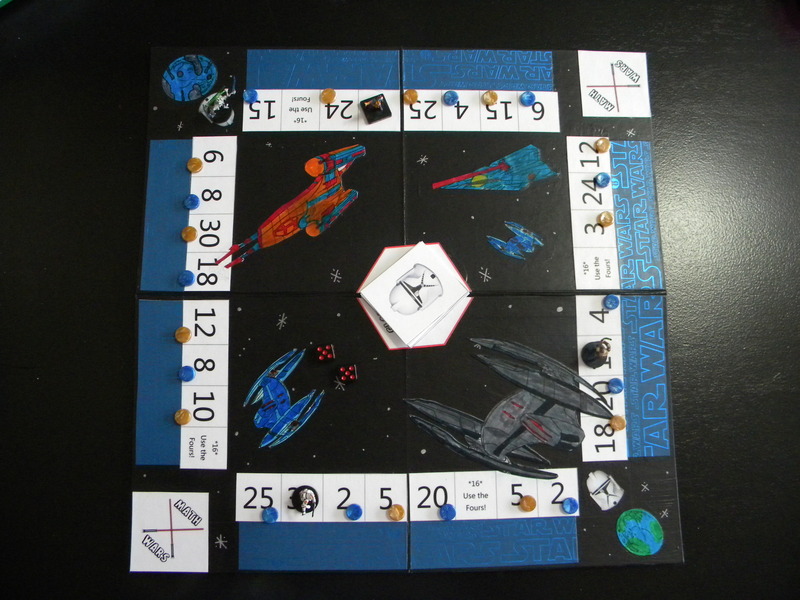 I printed each module on a different color of cardstock and laminated the term with the definition on the back. We will be using them for a Slylanders themed chemistry game but you could use them for matching, pocket charts or as regular flashcards. I also included common elements and their abbreviations. Click ChemistryVocabCards to download the file for modules 1-8 and the elements. I plan to have modules 9-16 ready by Christmas. Spanish 2: Living Language Spanish; Complete Edition (includes text, workbooks, audio CDs and online learning). This is a switch from Rosetta Stone last year. I was not that impressed with Rosetta Stone for the price. There was some kind of glitch that required me to reinstall the software 1-3 times per month and losing all of the saved progress. The price point for Living Language is within our budget and had good reviews. L and J do many subjects together including history, literature, art and geography. History and Literature: We will be using the free literature based curriculum American History Menus. Grammar: GUM Drops grade 3, games, copywork for American History Menus and Geography. Geography: I am really excited about WorldWorld Geography. Each weekend I will load a vintage, well-travelled suitcase with books, recipes, maps, notebooking pages and more for the country we will “visit” the upcoming week. On Monday morning the children will get to open the suitcase to see where we are “going” (they are already begging to start). After learning about each country they will get a flag sticker for their passport. In addition to library books we will be using Bold Believers, Expedition Earth, Trail Guide to World Geography, Uncle Josh’s maps, Christmas Around the World cards, Sea Bird, Montessori style geography cards, The Librarian Who Measured the Earth, and How to Make An Apple Pie and See the World. We will do crafts, study animals from the country, cook native(ish) recipes and play games including Quick Pix and Map Tangle. Music and Art: Artist and composer studies to correspond with history and geography, piano lessons, music therapy, free play with instruments and art projects with different mediums. Science: We will be doing mostly hands on physical science with some animal studies to correspond with geography and nature studies to go along with history. I plan on doing units on electricity, earth science and engineering including Knex bridges and A Child’s History of Architecture by Hillyer. Math: We all play a math game together at least four days a week (Quick Pix, Dino Math Tracks, Dino Dice, Math Wars, etc.). 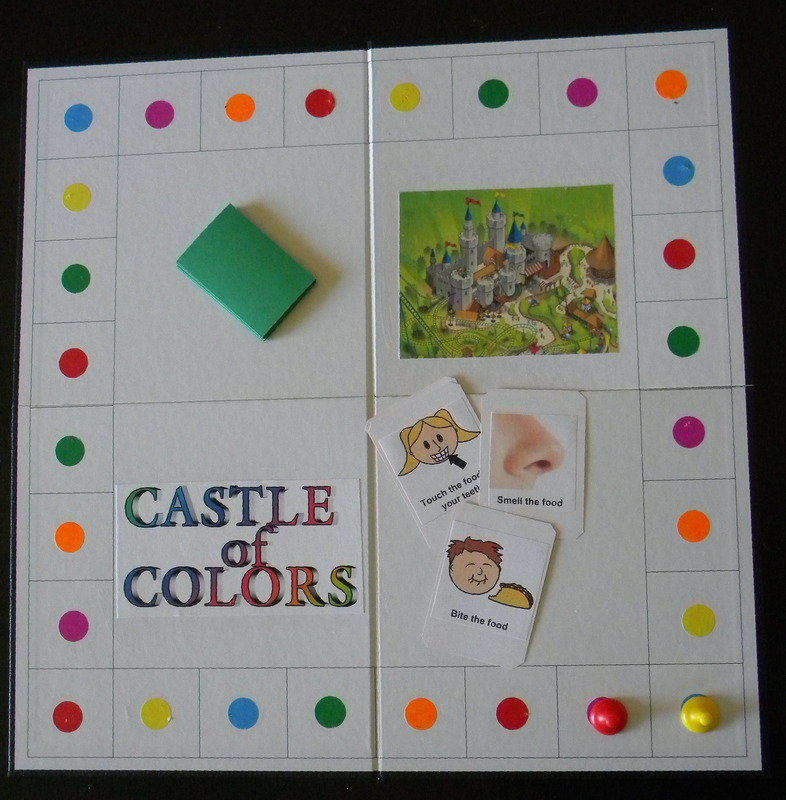 I have created many file folder games to use for independent work and we use a lot of manipulatives and Montessori style activities like the the stamp game and geometry cards. L is working at the beginning of Saxon Math 3, the repetition and slow pace are just what he needs. J is just finishing Horizons 3 and will soon be in Horizons 4. Life Skills: I choose activities to work on from Contenders for the Faith (L) and Keepers at Home (J) whenever possible, the little badges are a great incentive. 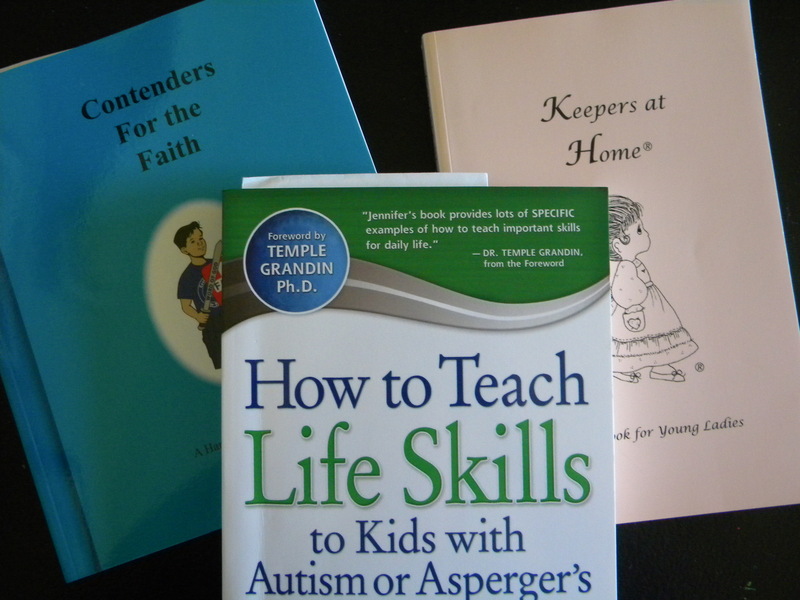 How to Teach Life Skills to Kids with Autism has been a great resource for me. L is currently working on tying his shoes, sweeping and using a microwave/kitchen safety. J is learning to follow a schedule independently including doing her chores (folding laundry, watering plants and feeding the fish). During the week we work on increasing food tolerances through games and play food, and do activities for OT, PT and speech. 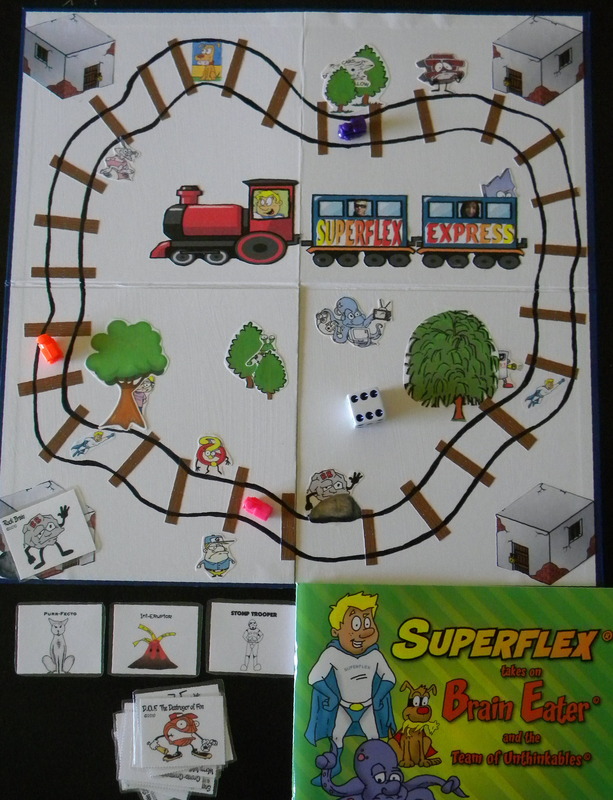 We also use and practice the Zones of Regulation and Superflex Social Thinking curricula every day. Bible: Memorizing verses to coordinate with copywork, history and science; BibleIs and watching Nest videos. J will be memorizing some Psalms from a lighthouse themed Psalm book and Logan will be memorizing Acts and plans to join the junior Bible Quiz team. Extra: Activities outside the home include 4H, Special Olympics, OT, Speech, therapeutic horse riding, PT, music therapy and play therapy. L and J both have skills workers that come into our home each week for two hours. As usual, I reworked our school rooms over the summer. I moved the piano that was along this wall and replaced it with this buffet this used to live in the kitchen. One day I will have two Expedit (or Kallax I think they are called now) units along this wall. For now, the buffet will have to work. I have milk crates on top to hold L and J’s binders, with home-made games on top stored in scrapbook paper cases and large games in the cabinet portion of the buffet. 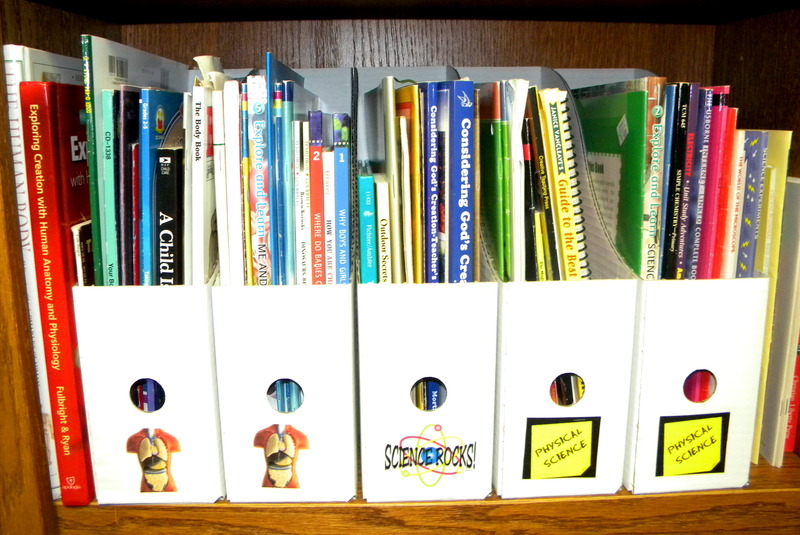 In the Trofast units are drawers for L and J to keep their personal workbooks, notebooks, etc. as well as OT supplies, scissors, colored pencils, fidgets, chewies and math supplies. The white Target shelf has J’s weekly schedule on one side and holds larger items such as sorting trays, Montessori trays and therapy putty. On top of the Trofast units are Sterilite bins that hold the math manipulatives and sensory items we are currently using. 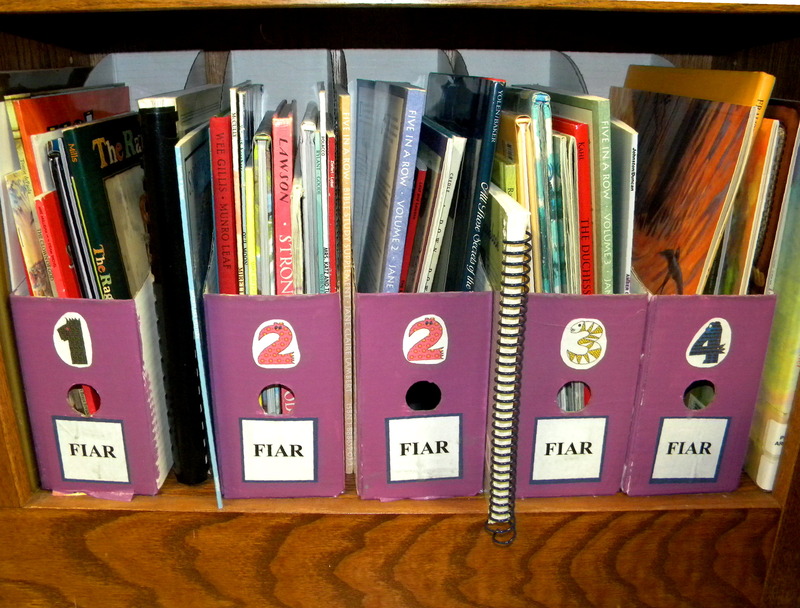 Fine motor manipulatives and J’s token jar (we give her a token when she uses her words) are housed on the white shelf. 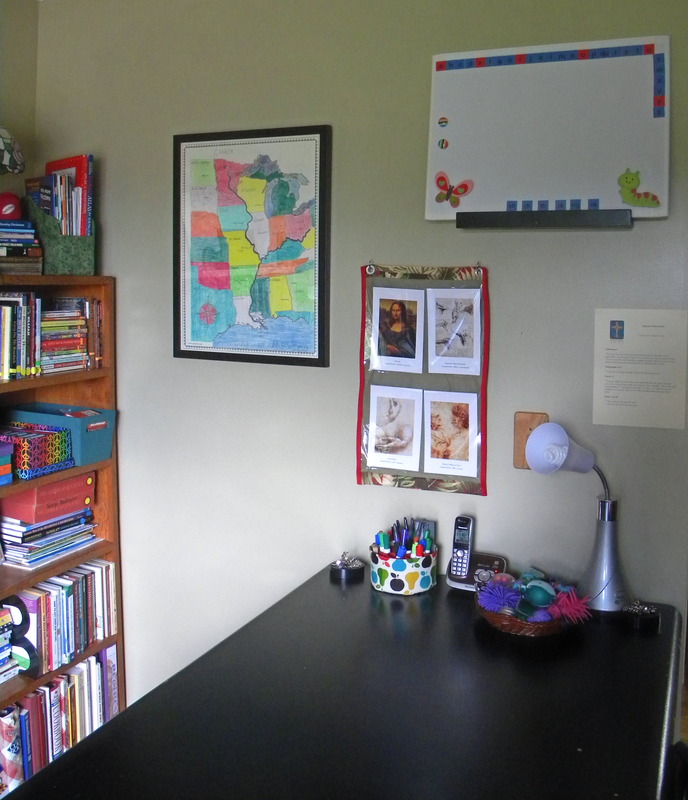 Along the opposite wall is a bookcase that houses our books for the upcoming year as well as small educational games, flashcards, Montessori cards and All About Spelling materials. The teal bins were brown last year, I painted them with some acrylic paint to spruce them up a little. I used scraps of fabric to decoupage a shoe box to hold our 3×5 cards as well as boxes for spelling. 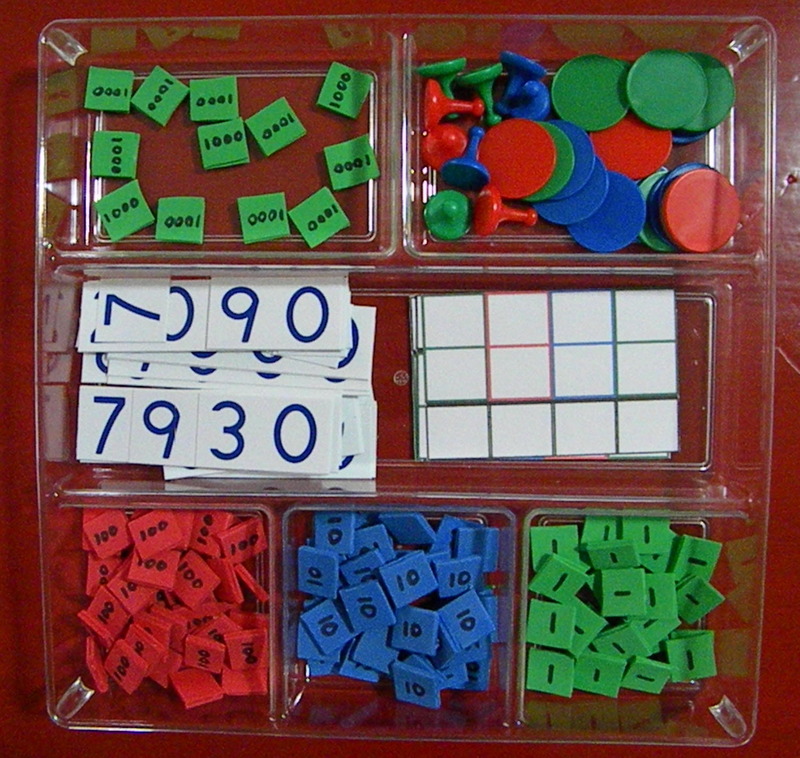 The little square boxes are “micro boxes” from Rainbow Resource. Next to the bookcase is another new addition – a 2×3 Expedit! 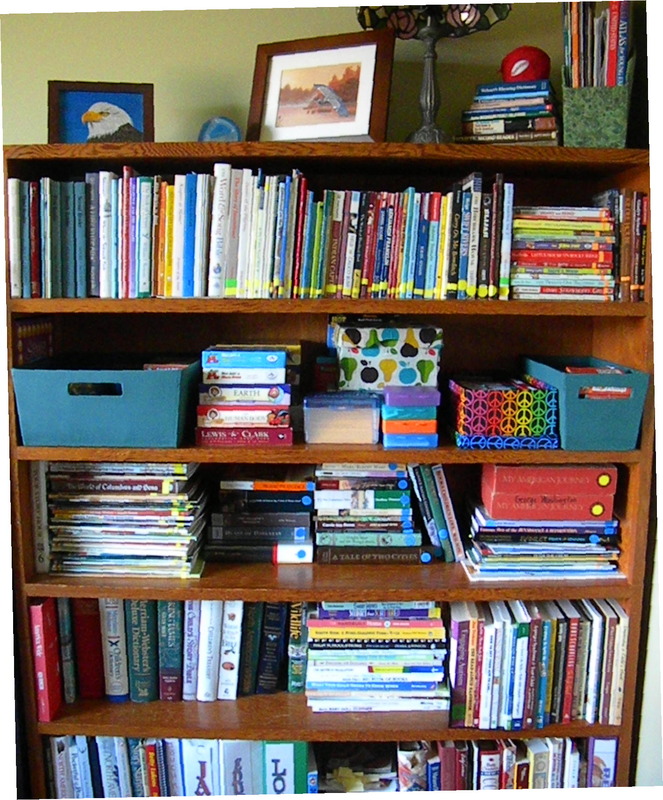 The right side holds books I use daily – geography books, teacher’s manuals, art resources and L and J’s mini offices. C’s binders and textbooks are on the left. 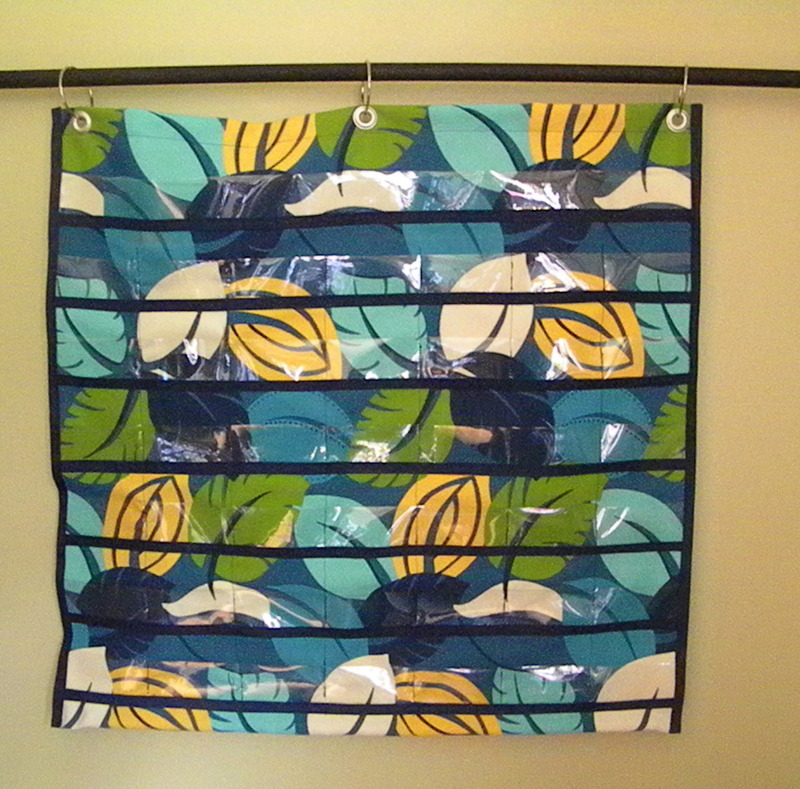 The plastic bins are just ice cube bins decoupaged with more scraps of fabric. They are perfect for holding “slouchy” books. On top of the Expedit are basic supplies like pens, pencils and white-out as well as my black spinny thing Office Apprentice. 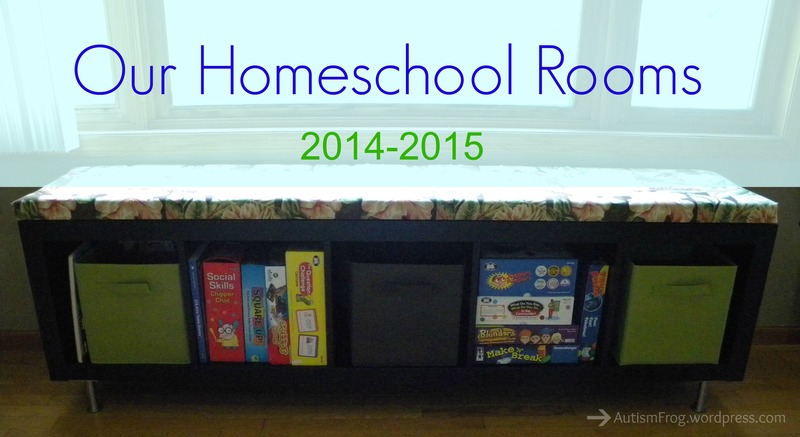 I keep all of my upcoming printables, clear covers and file folder games in the center. 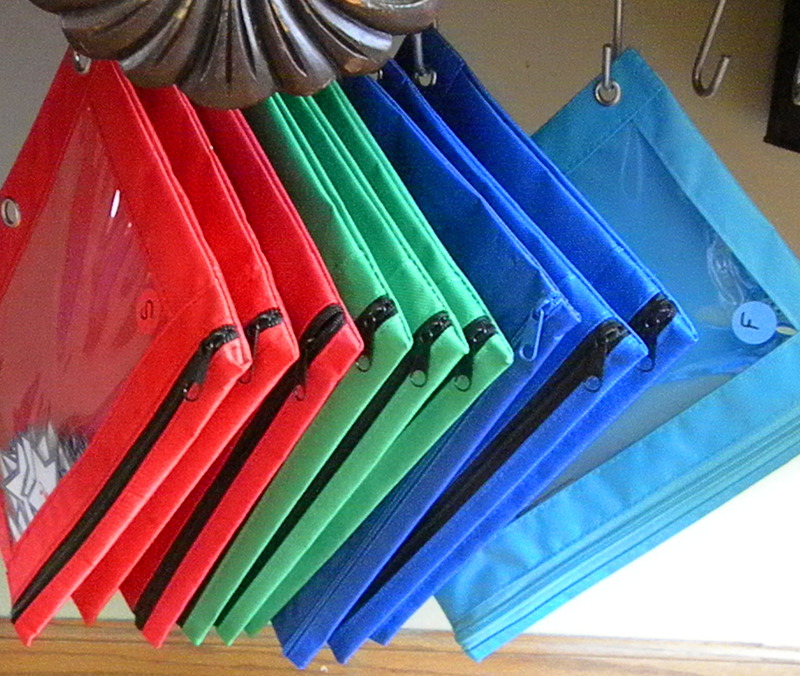 Each file folder has a color coded sticker and letter so we can easily find the right zipper pouch (currently hanging from a tension rod under the buffet) containing cards and game pieces. 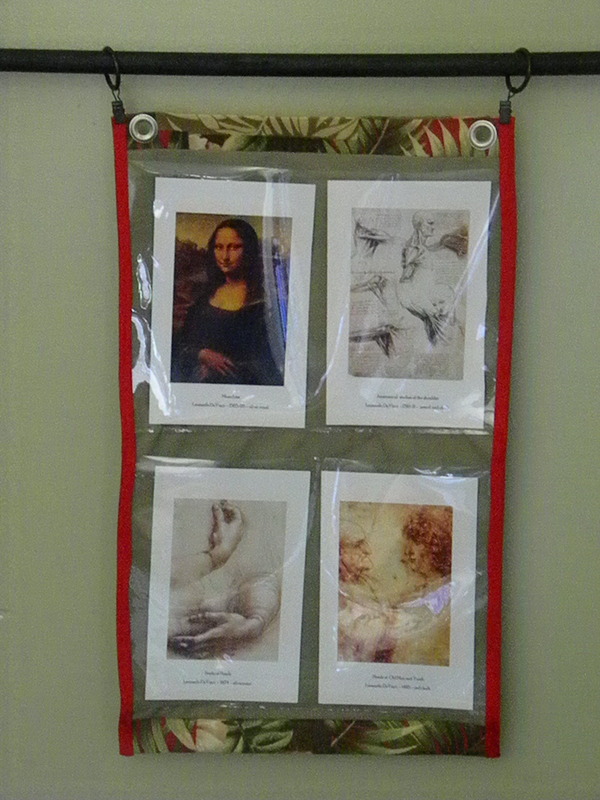 I built two new art ledges to display the masterpieces. The table is where most “together” work happens. On the wall I have a mini ledge to hold our spelling board out of the way and a pocket chart I made to display art cards for our artist studies. On the table is a fidget basket and white board marker holder made from a plastic tub, toilet paper rolls and decoupaged fabric. My favorite new addition to the room is my DIY map rail/pocket chart system. I purchased a wooden dowel ($1) and closet rod holders ($3) from a hardware store. I cut the dowel to size and painted everything black. 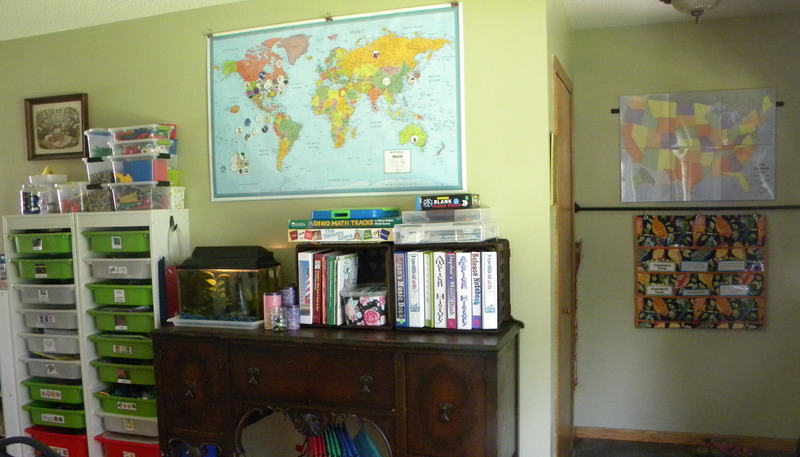 Maps and posters can be hung with curtain clips; pocket charts with book rings. The dowel pops right out to change charts quickly. Above that is simply a yard stick (painted black) with velcro attached and screwed to the wall. Right now it holds out USA markable map. I love how easy it is to take the map off for mapping work and then stick it right back up. On the door is our Calendar Connections pocket chart simply held on with magnetic hooks. 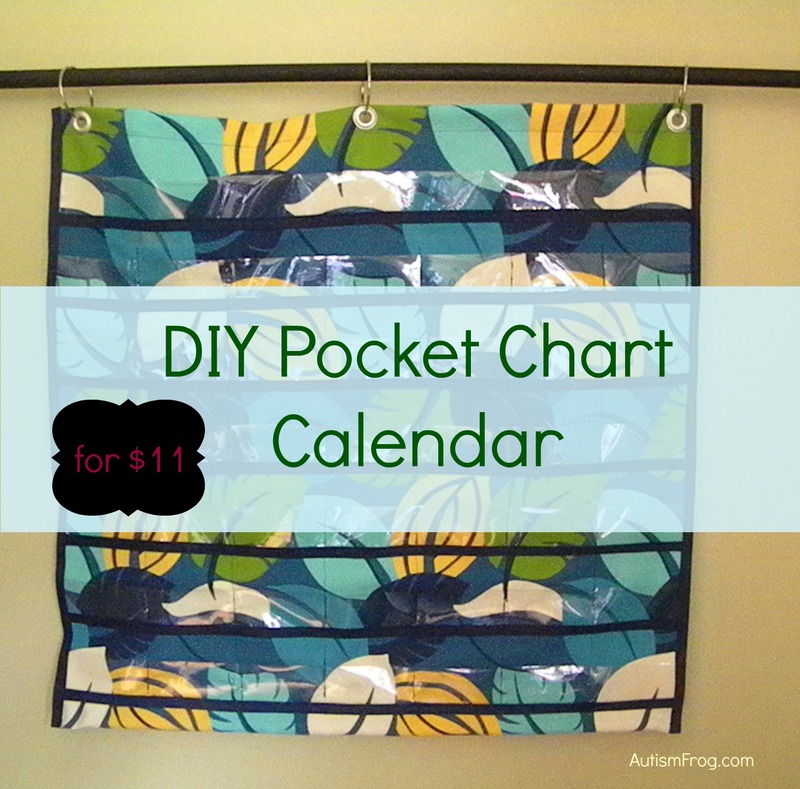 See how I made the pocket charts here. In the dining room I have an Expedit turned bench that holds our speech resources, social skills games and bird watching guides/binoculars. In the hallway and on the fridge are their daily PEC schedules, chore sticks and L’s weekly schedule. 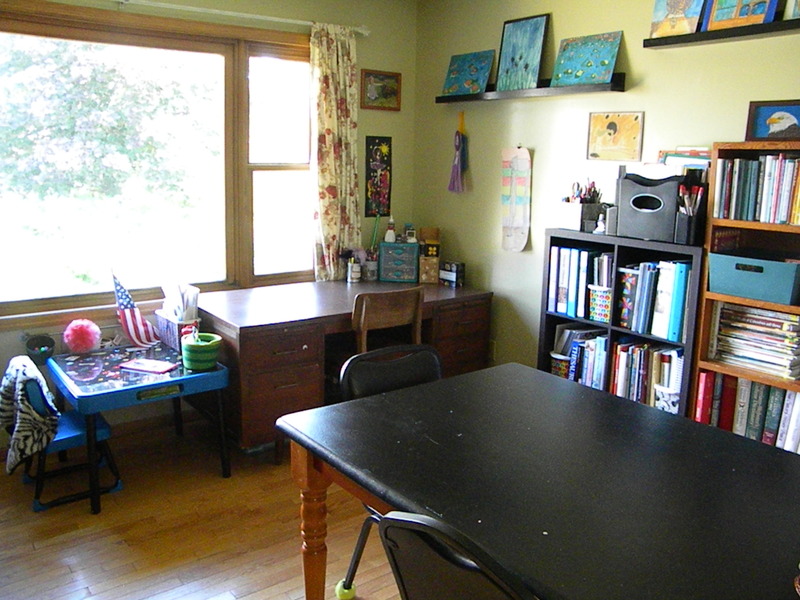 Downstairs we have a large room that serves as a sensory room, art room, play room, physical therapy room and homeschool storage. One end has a reading nook with a giant whiteboard and the other end features a crash pit. 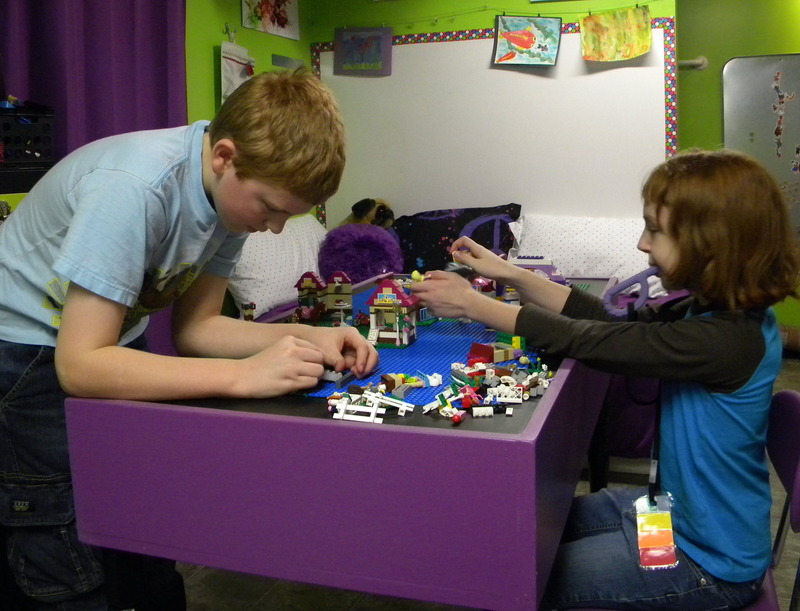 See more about the Sensory Room on my blog. Along one long wall are 3 cabinets for games and art supplies as well as several more bookshelves. To help keep things organized and easy to find, I have a color coding system for fiction books. 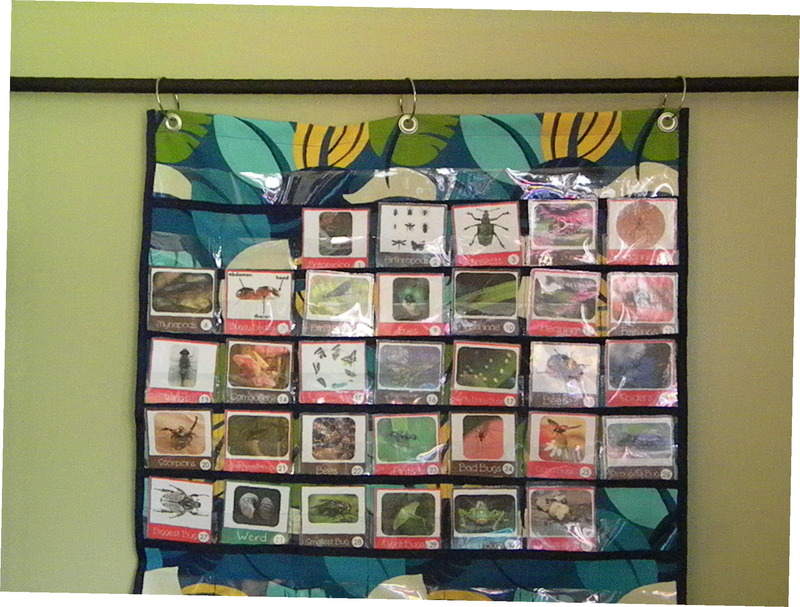 Nonfiction books are organized by theme. I decorated white magazine boxes with clip art and fabric. It’s super easy to find books and put them away. Most ready made pocket charts are pretty hideous, less than sturdy and fairly expensive for what you get. When I found these beautiful calendar cards on 1plus1plus1equals1, I knew I needed to try to make a pocket chart worthy of displaying them. 1. Find the top of your fabric. On the WRONG side press under 1/2″. 2. Press again at 1 1/2″. Sew close to pressed edge. This will provide a nicely finished top and a thick layer of fabric to attach your grommets to later. 3. Repeat steps 1 and 2 for the bottom edge. This will create a casing for the dowel. 4. 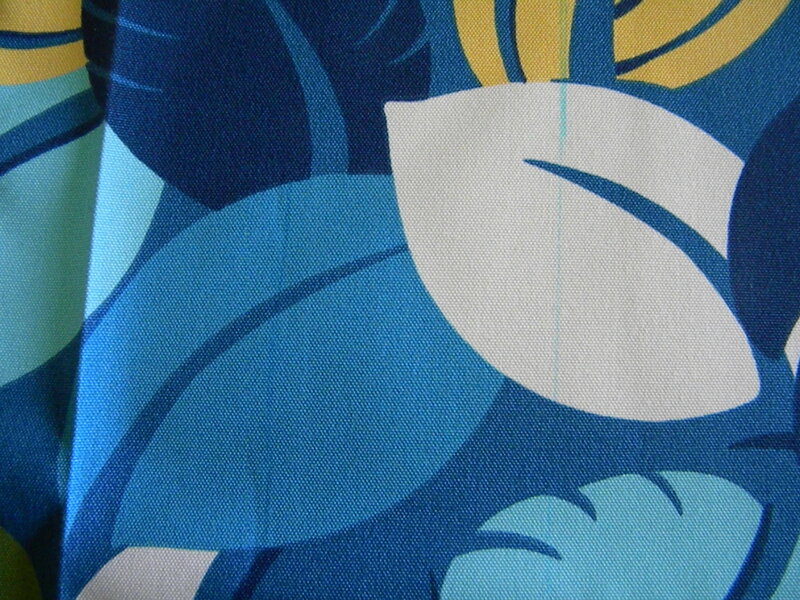 Using the square and a fabric pen or chalk, mark horizontal lines for the pocket placement. I wanted 7 rows for my chart so there is room for a title and 6 rows for calendar dates. My cards are 3.25″ tall, so I marked horizontal lines every 3.5″ to allow a little space between each row. 5. Use a dry erase marker and the square to draw your pockets on the vinyl. My pockets are 2″ tall and 28″ wide (the width of the chart). 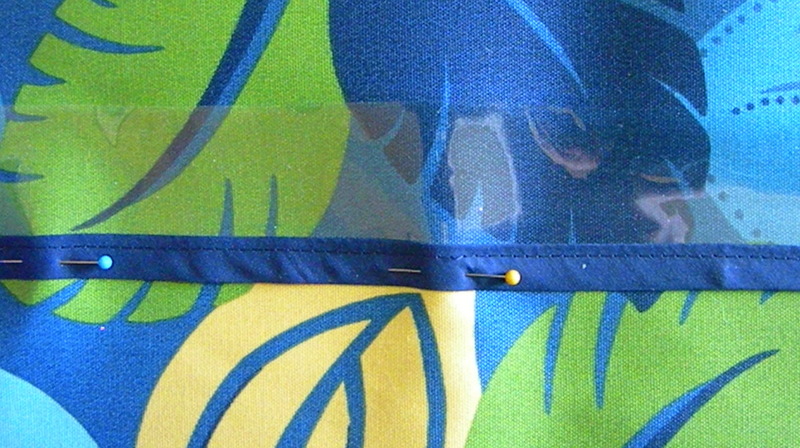 Cut out the vinyl with a utility scissors, please do not use your fabric scissors! 6. Cut 7 pieces of bias tape, each the width of the pocket chart. 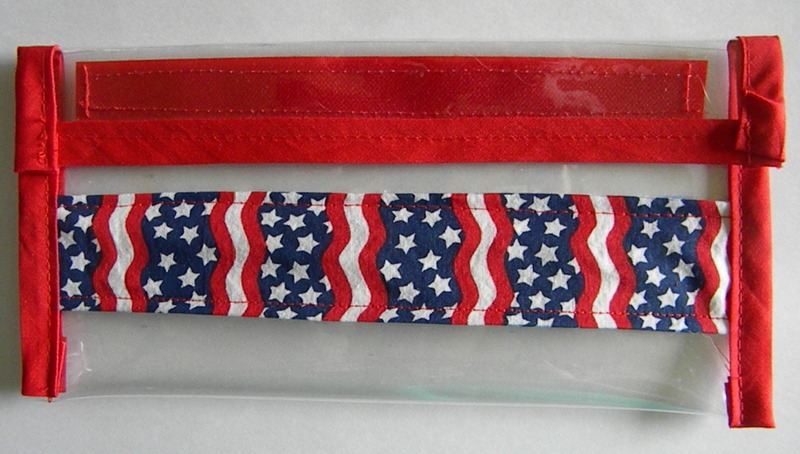 Attach to one long edge of each pocket with paper clips. 7. 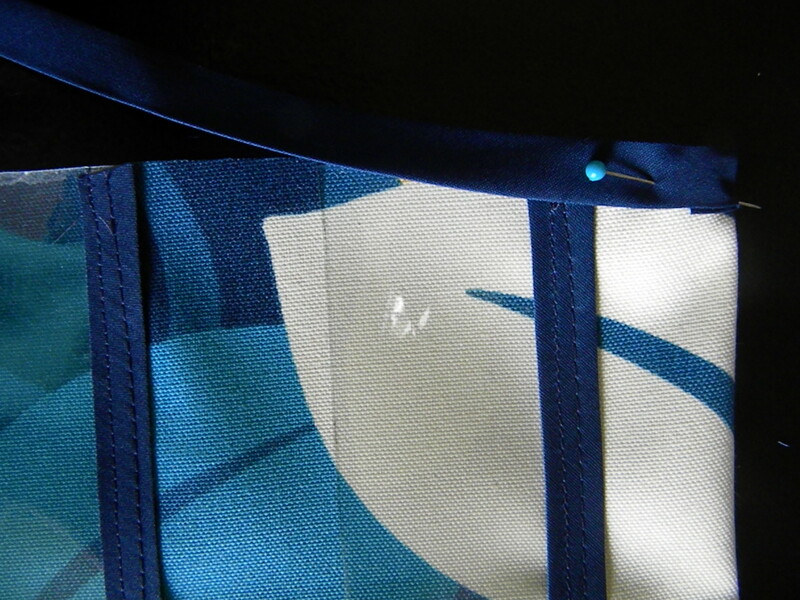 Sew the bias tape to the vinyl using the longest stitch possible (on my machine this is “4”). 8. Pin each vinyl pocket to the chart as shown. 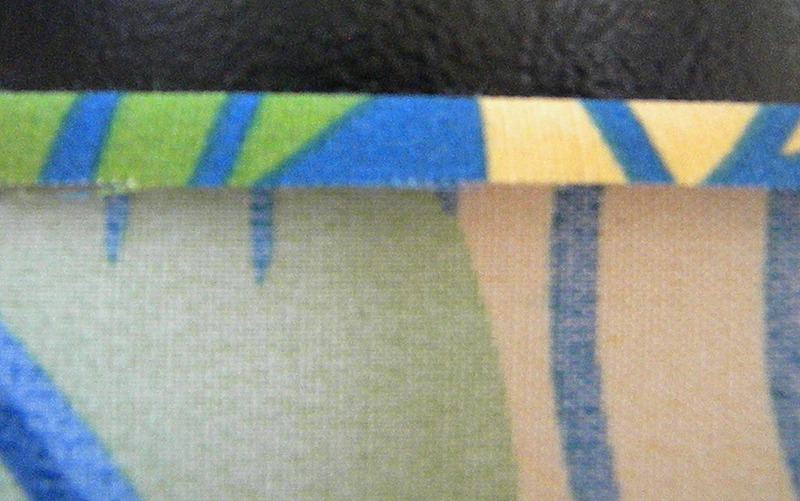 Note – the bias tape is the bottom of the pocket. Sew each pocket to the chart, again using a long stitch. 9. Next, use the square and a dry erase marker (only on the vinyl) to mark the vertical line placement. Sewing along these lines will create a pocket for each card. 10. 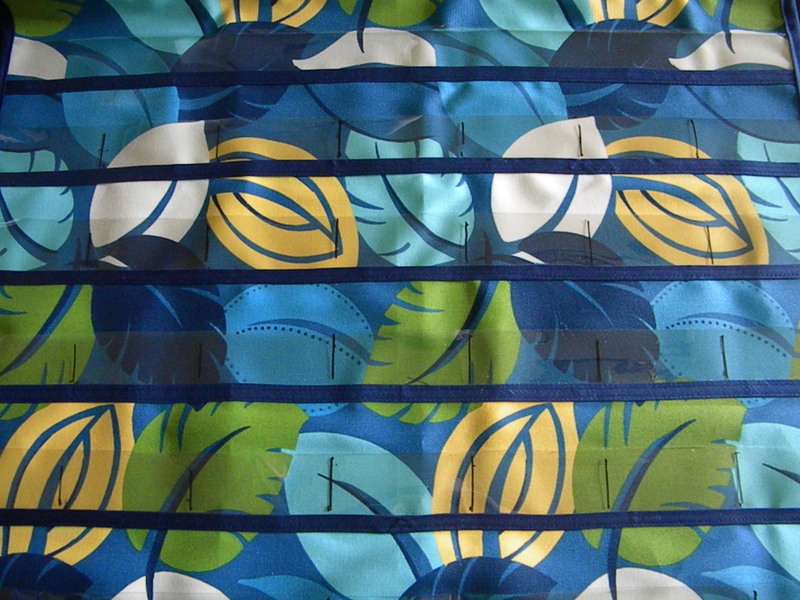 The next step can be a little tricky…sewing along each vertical line. 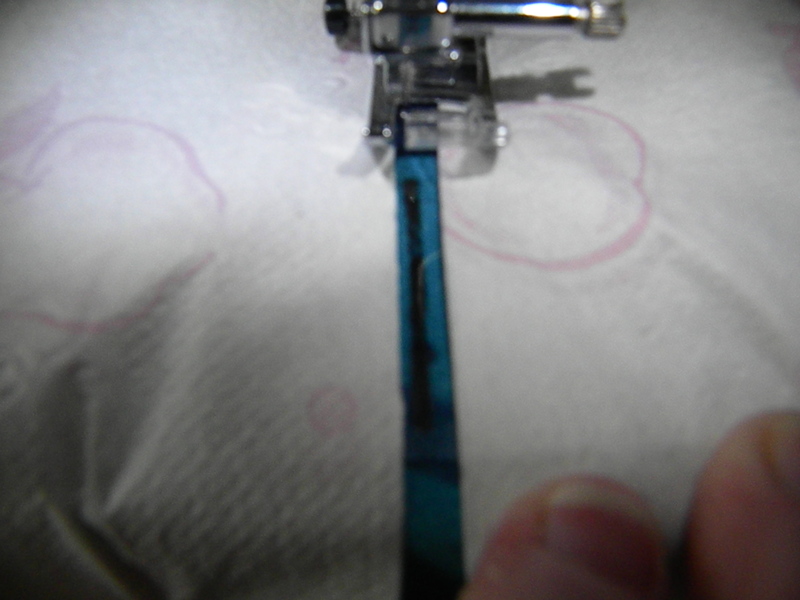 When you sew directly on the vinyl it rends to stick to the presser foot. To prevent this I place a napkin on each side of the sewing line, which allows the presser foot to glide. (I have also heard that putting scotch tape on your presser foot will work, if you don’t mind sticky residue on the foot when you are done). 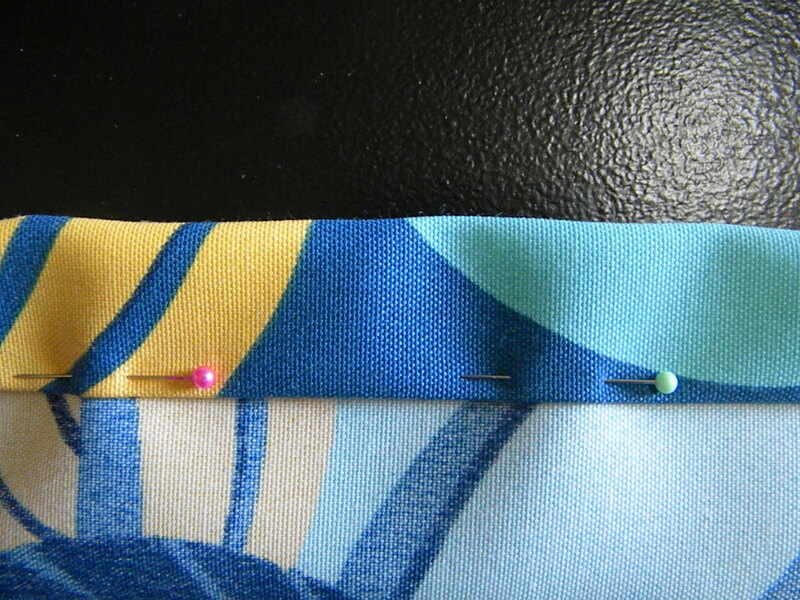 Use your longest stitch and sew up from the bottom so you don’t catch or wrinkle the pockets while sewing. 11. Almost done! 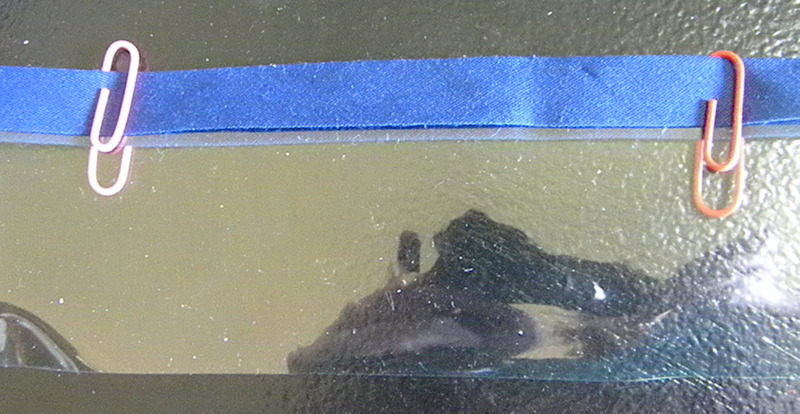 Cut 2 more pieces of bias tape, each 1″ longer than the chart (mine were 29″). Fold and press each end in 1/2″. Pin one piece of bias tape to the right side of the chart, encasing all vinyl edges. Sew. 12. Insert dowel into bottom casing, sliding it all the way to the right. 13. Attach and sew remaining piece of bias tape to the left side as directed in step 11. Center the dowel in the casing. 14. Add 2-4 grommets to the top casing. and even a pocket chart to hold the cards for the other pocket charts! What is American History Menus? 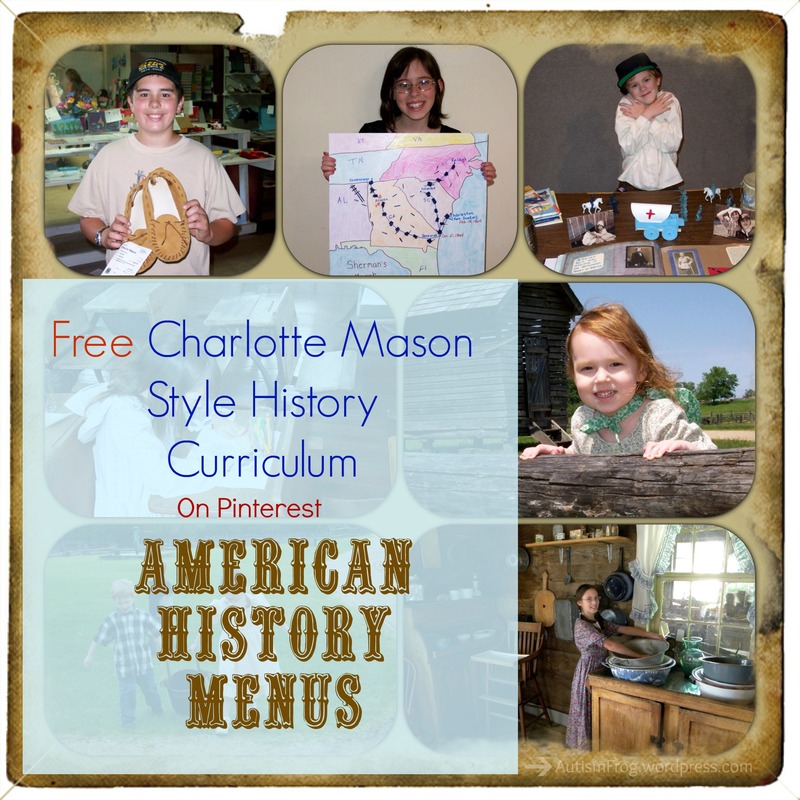 Each printable Menu corresponds with an American History Menus unit. 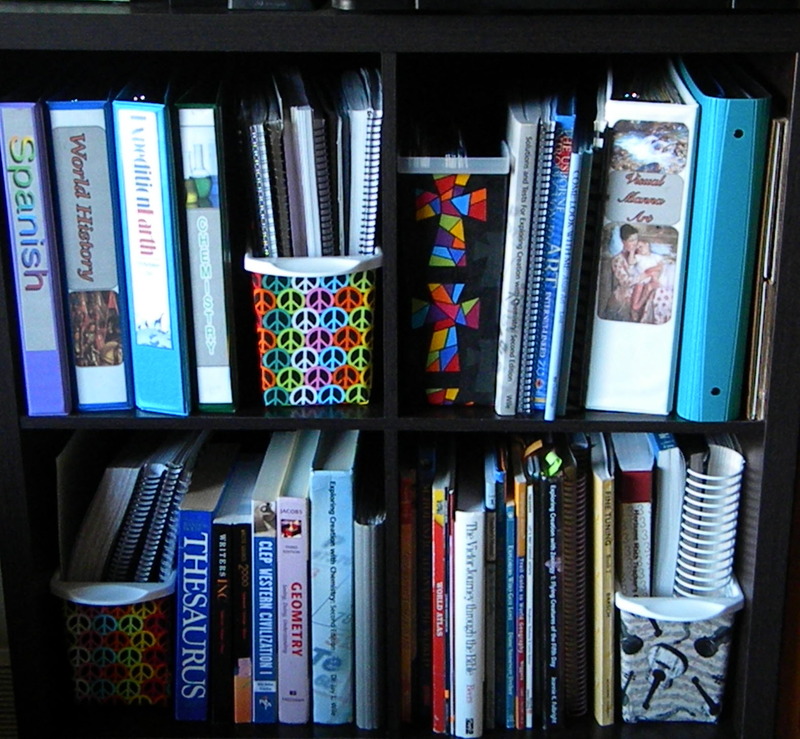 Menus have three parts; the Appetizer (spine), the Main Course (books by reading level), and sides (art studies, notebooking, lapbooking, science, hands on activities, etc.). Each menu also has a corresponding Pinterest board with links to a description of every book and links to all resources, websites and printables. 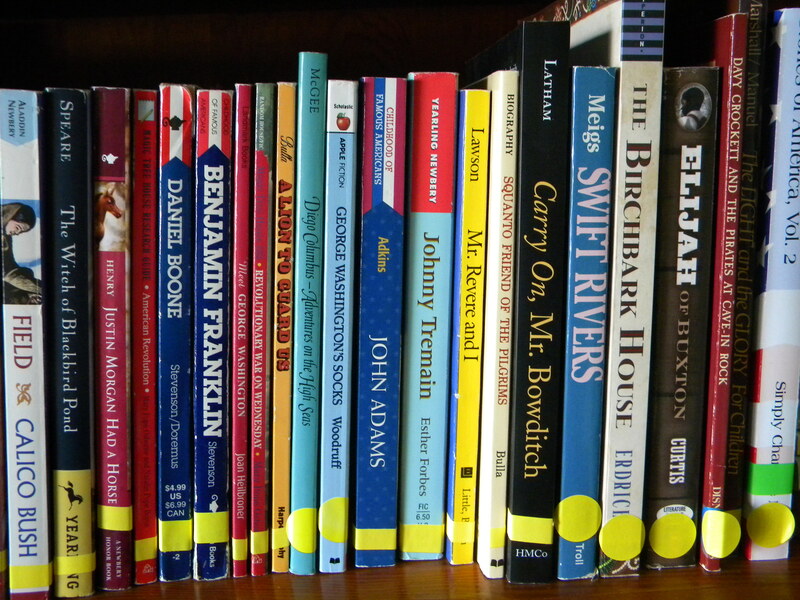 Most had minor problems – copywork lines not the right size for my students, books that I (or the children) didn’t like, books that I could not find, etc. Many had what I considered major problems for our family – too many expensive required resources, giant disorganized manuals that kept me flipping pages most of the day, readers that did not correspond to the period being studied, etc. Once I “tweaked” the curriculum (adding notebooking pages, lapbooking, art, period readers, appropriately sized copywork, and added in all the books that we wanted to read) there was very little of the original left and trying to make everything fit was truly more work than just designing my own curriculum. 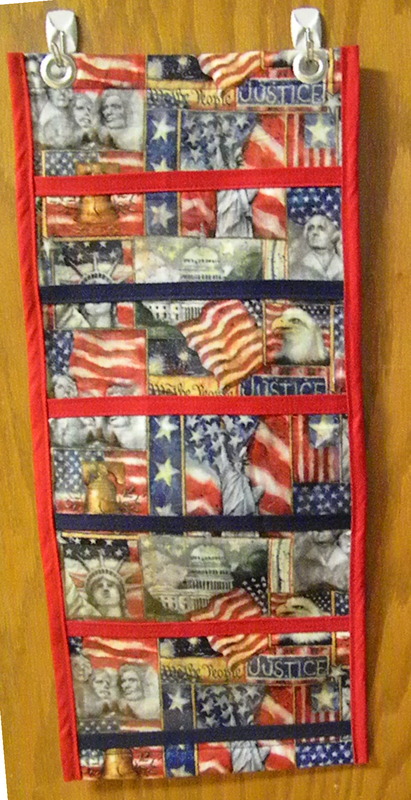 American History Menus is NOT a day by day or week by week lesson plan. If this is what you need or want – American History Menus is not the curriculum for you! I would love to hear from you, drop me a note and let me know what you think about American History Menus. Please link directly to my site when sharing with others!